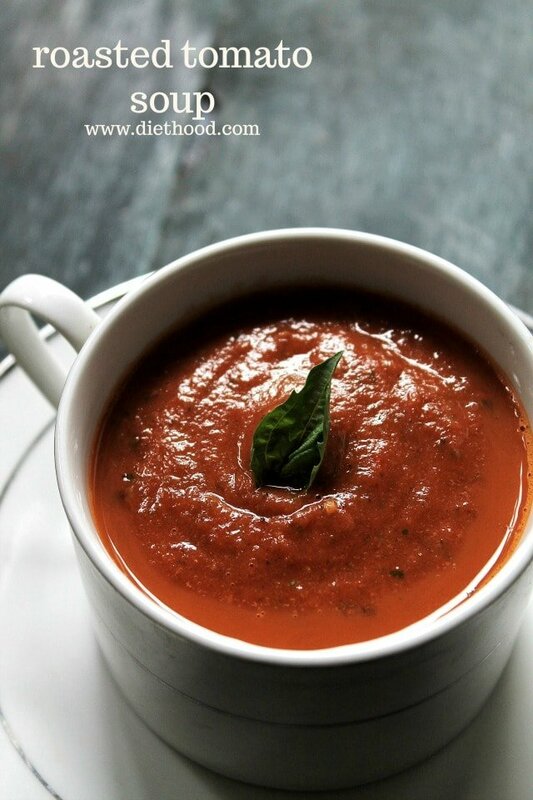 A delicious Roasted Tomato Soup made with garden fresh tomatoes, garlic, onions, and basil. It’s soup soupah time! Yes, sou-pah. That’s the way you say “soup” in Macedonian. I haven’t taught you Macedonian in a while so I thought I should throw something easy at ya. Tell me, is everyone talkin’ pumpkin recipes? I thought I should wait a week or two before I go ahead and post mine. But, I’m ready! Oh boooooy am I ready!! Can’t wait to share! However, if you are itching for some right now, you should definitely start with these Pumpkin Muffins. They are the bestest! Even so, I still meant to talk about cake today. Or cookies. Somehow I ended up at this lovely Roasted Tomato Soup. Remember last week when I shared my Ricotta and Orzo Stuffed Tomatoes recipe? And I told you about my very generous garden and all the tomatoes it has given us? Well. I’m still working on using up all my tomatoes before they go bad. And I assume I’m not the only one that has 300,000 bushels of tomatoes to use up, am I?!? I’m just trying to help out everyone that is in the same boat as me. This roasted tomato soup is totally a summer-crossing-into-fall type of soup. I mean, you’ve got these wonderful summer tomatoes that end up in a roasting pan with garlic and onions. That right there should make you want to pray for cold weather, pajamas, and tomato soup. With a side of grilled cheese… oh. my. YUM! I completely forgot to make some grilled cheese sandwiches to go with this deliciousness!! DUH! You know what’s best about this roasted tomato soup? How easy it is to put together. You can probably make it in your sleep. You’re just going to throw a few lovely things in the oven, and then, once they are ready, you will take all that yumminess for a ride in the blender. That’s it. There’s absolutely nothing to this. Just simple, delicious food. In a large mixing bowl or pot, combine halved tomatoes, garlic, onions, olive oil, salt and pepper. Spread tomato mixture on prepared pan. Transfer roasted tomatoes to a blender and add sliced basil. Looks wonderful! I have a question though, how many servings does this make? I want to include this in a ladies luncheon I am hosting and want to make sure I make enough. Thanks so much! after roasting in the oven, I just transfer the tomatoes? Leave the onions and the rest behind? Hi Lisa!! No, transfer everything to the blender, including the onions. Hi Ashley! I’ve never tried doing that so I don’t really know for sure. Google says yes, :-D, but I can’t recommend it myself because I’ve never attempted to can this soup. Do you take off the peels after roasting or blend everything? Hi! No, I don’t peel the tomatoes – I just blend everything together. Do you remove the seeds before roasting? What would the weight be for the tomatoes? I have all shapes and sizes and not sure how to proceed. Thanks for a quick reply- I am excited to make it tonight! I would say around 2.5 to 3 pounds. I hope that helps. Have a great Sunday! The tomatoes I have are huge weighing maybe close to 1 lb each. Should I adjust qty of tomatoes per batch or still use 8-10? I have made this recipe over and over. It’s the best by far! Just have huge tomatoes and don’t want to sacrifice the balance. Love the recipe! I only don’t have a blender. You think its possible to make this but than mash it after with a masher? Hi Maartje! I highly recommend a blender for this soup, or any other soup recipe that asks for whole vegetables. Having said that, I guess you could use a masher, but I am not sure that you will be able to get it as soupy without a blender. Also, you might have to peel the tomatoes before mashing because, if you’re going to mash the tomatoes, the peel will just separate and end up in your soup. I hope that helps! Please let me know if you give it a try. Thank YOU! Could you use an immersion blender? hello, this looks delish, I don’t have feesh basil, do yiu think I can use dried? Hi Sonia! So it won’t taste exactly as it should, but you can definitely use dried basil. I would use about 1-1/2 to 2 tablespoons. Let me know if you liked it! Thank you! Just made this today with some late season tomatoes and gypsy peppers. Added about 2 cups chicken broth and some Italian herbs. This is really the best tomato soup ever! Wish I had lots more tomatoes! That’s exactly how I feel every time I make this soup!! I just want moooooore! 😀 SO happy to know that you also enjoyed it! THANK YOU! this recipe sounds so delicious and I too have an abundant of tomatoes this season. Do you know if this freezes well? Yes, it does freeze well. I have done that on a few occasions and it was delicious!! This looks like just the soup I’ve been looking for! No cream, just robust tomato flavor. Do you recommend a certain type of tomato? I’m thinking that if I use only roma tomatoes, it may not have enough liquid. Maybe I should buy an assortment? Since it is early March, I’m going to have to use store-bought tomatoes, so I might add a can of fire roasted tomatoes to give it a little more oomph, but I’ll wait and see how it turns out using only fresh first. Store bought are never as good as home-grown, though! I just made this and it is delicious! I wound up adding a little bit of my home-made vegetable broth to thin it out a little. Thank you! After I roasted my soup vegetables, I roasted some eggplant, then put the eggplant in my bowl before putting soup over it. Deeeelicious! I made this for my two kids and husband-I went to work out, thinking that there would be some leftover. Nope! All gone! I know that this recipe is a definite keeper! Thanks! This was my first time making home-made tomato soup. Wow! It’s definitely a keeper. This soup tastes so fresh! I made a double batch, but will make another double batch and preserve. Excellent soup and so simple. I picked up a basket of tomatoes and the soup was ready in no time. I may buy another to load up the freezer for lunches. Thank you so much!! I am really happy to know that you enjoyed it! 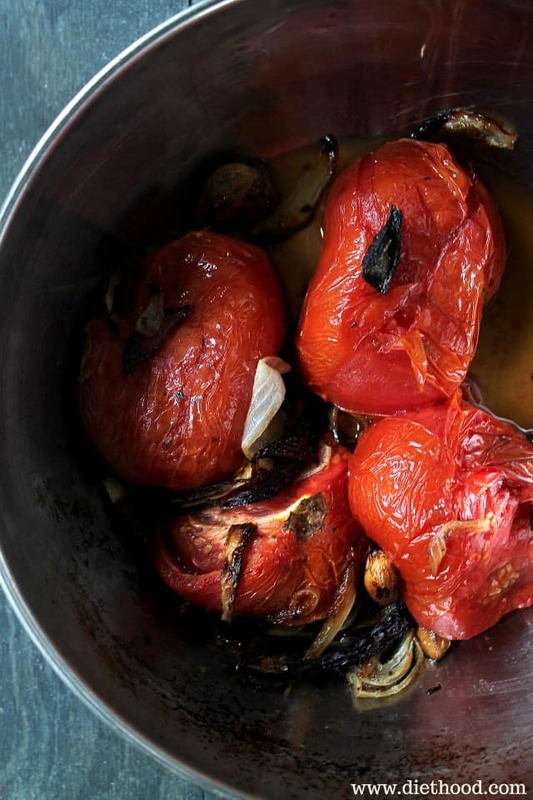 Love the idea of roasted the tomatoes. There’s nothing better in the fall than tomato soup and grilled cheese. Great soup! My plants and farm share have been producing like crazy, and I’ve been canning many quarts of crushed tomatoes in anticipation of winter. I’m good for crushed tomatoes, now (you think 20 qts is enough?? Maybe I should do more?) I think I’ll try this, and if the kids like it, perhaps I can freeze a few recipes of roasted tomatoes to make soup in the winter. 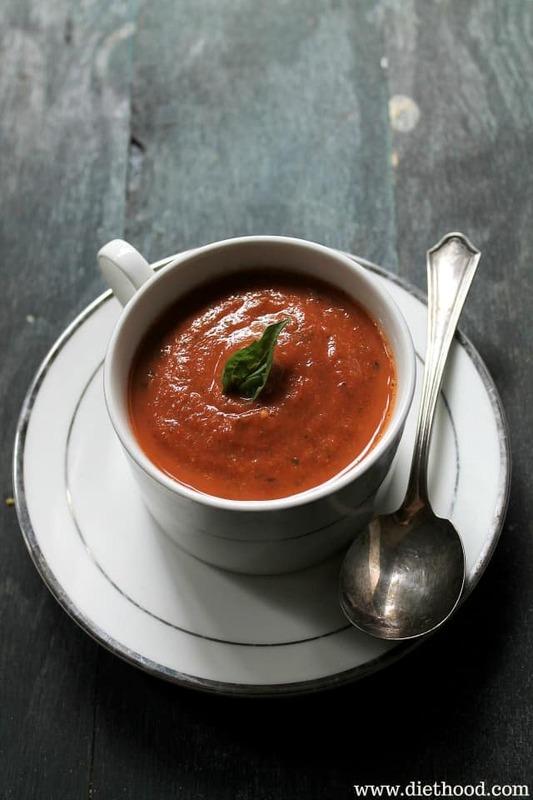 I love tomato basil soup and for some reason it has never occurred to me that I could make it, even though I make a wide variety of soups each year. I was happy to find this recipe as I had a huge bag of fresh tomatoes from my brother-in-laws garden and a new basil plant. This recipe is DELICIOUS! Thank you so much! Thank you, Dani!! I am SO glad you enjoyed it! No pumpkins yet, pleases. I will, however, take a bowl or two of this cosy sou-pah! Tomato soup is my fave and I love that you roasted the tomatoes! 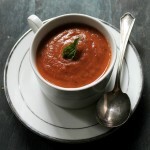 Tomato soup is so delicious, and roasted tomato soup is even better! Your soup’s texture looks perfect! Ahhhhhh! I love tomato soup! It’s my favorite. And no one else in my house will eat it (score!) Beautiful photos for a beautiful recipe! Tomato soup and grilled cheese-I feel like a queen when I have this together. Such comforting food, perfect for fall! Oh my gosh!! This looks so homey and comforting!! I NEED to make this! I have been making soups all last week and this week for the hubby and am running out of ideas! So going to add this to my list! This soup is pure comfort in a bowl/cup!!! I am sold out to this roasted tomato soup. I am not a tomato soup fan but the roasting of tomatoes in this soup sure makes the soup taste amazing. My Romanian mom used the same word for soup in the former Yugoslavia. She never made this tasty sounding tomato one though.